Five hundred years later, Kekaumenos advised the commander to learn all he could about the enemy and, only after thorough investigation, line up for battle. He should weaken the enemy by tricks, machines, ambushes and last of all, if there is no other way, engage in battle. Leo Phokas reminded his troops that wars are won not so much by pitched battles as by cautious prudence, cunning, and timing, and he forbade any reckless charges in the open field. 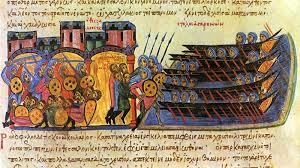 This entry was posted in Articles and tagged Battle, battles, Byzantine, early medieval, Papacy, social history, Strategy. Bookmark the permalink.